This crackers were tried out from my baking cook book collections and after seeing the final outcome, I started to prepare it quite often. Now a days it has become our most of the time evening snack with a cup of tea. You can feel the crispiness of the crackers and crunchiness of the cashew nuts at the same time. Dried thyme leaves add a very nice flavour too. If you are going to try it out, do not compromise any ingredients except egg. You will definitely like it. 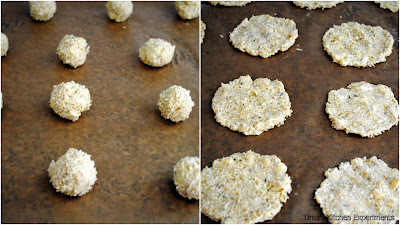 I am blogging here the cashew nut version of oatmeal crackers. 1) Preheat the oven to 180C/350F. Grease the baking tray with butter or line it with baking sheet. Spread out the sesame seeds in a wide plate. 2) Mix Rolled oats, unsalted butter, plain flour, salt, dried thyme and cashew nuts in a mixing bowl. Lightly rub them using your finger tip. 3) Add beaten egg little by little till you get the soft dough. It is not required to use the full egg here. 4) Once the dough is ready, make a gooseberry size balls and roll them in sesame seeds to coat lightly and evenly. 5) Place the balls in the prepared baking trays. Make sure to leave enough space between dough balls. 6) with the help of rolling pin or hand, roll over the balls to flatten them as much as possible. 7) Keep inside the oven and bake it for 12- 15 minutes or until it is pale golden. 8) Cool the baking trays for 3-4 minutes, then transfer it to a wire rock to finish cooling. Note: I used my hand to make the balls flatten with the help of remaining beaten egg. The beaten egg/water avoids stickiness of batter with hand while flattening. Linking this recipe to Lite Bite's - WWC - Oats In Baking. Cookies look crunchy and yummy! Crunchy and flavorful crackers... Looks perfectly baked. very crunchy n delicious looking cookies...bookmarked!!! Nice crunchy crackers !! Awesome clicks !! Looks crunchy.. Nice clicks.. Is there any alternative to egg in this recipe? I tried the recipe and had a problem with the dough. The dough was VERY soft from the very beginning. I started adding egg and it just got worse - wet and runny. I ended up adding flour to get the dough to come together at all. Unfortunately, that just made the crackers very delicate and easily broken. Although they do taste good! I double checked the measurements. I did let the butter sit out for a while. Should it have been cold? The recipe is updated with new measurements for more accurate results.